Why is Turquoise Significant in Native American Culture? Turquoise holds a special significance in Native American culture, meaning something profound and specific to individual tribes. Referred to as the “stone of life,” many believe it is a living mineral because of its ability to change colors depending on its environment. All Native Americans believe that the earth is living and all things are precious. Turquoise is no exception, representing life, and is highly revered because of its color-changing properties. Factors such as the environment, light, dust, and skin acidity all play a role in how the stone appears to the eye. While most people picture it with a beautiful blueish-green hue, other variations exist such as white, light blue, yellowish-green and a copper color. All of these colors together represent the hues of the earth, which is one reason it remains so attractive to Native Americans. This beautiful blue stone which has been known to represent power, status, and luxury, is very important to the Navajo people. Because of its reputation as a stone that brings good fortune, they store turquoise in baskets or hang it from the ceiling in order to protect the family from evil. The stone was also brought into battles to protect the warriors from harm, and it is frequently given as a gift. Turquoise is in the myths told by the Navajo people as well as other tribes. One legend said that when it rains after a long period of drought, human tears seep into the earth and form turquoise. The stone is incorporated into many spiritual practices, one of which involves throwing the stone into a river and saying a prayer to the god of rain, Neinilii. The Navajo also speak of a goddess named Estsanatlehi (or Changing Woman), who is known for being adorned with turquoise. She began as a piece of turquoise that lived in a turquoise home in the West Horizon. Today, many young people dress in a way to pay tribute to this goddess at their coming-of-age ceremonies and sing songs to honor her. While Navajo people are strongly associated with the stone, it also held special meaning to many other tribes. The overarching theme for this stone is that many believe it will bring the carrier strength and vitality, though this belief varies from tribe to tribe. For the Pima, or “River People,” who reside in Southern Arizona, the stone represents skill and healing. The Apaches relate turquoise to the rain that is found at the end of a rainbow. They would even tie pieces of the stone to their bows, believing it would make them strong and skilled hunters and warriors who would not suffer harm in battle. The Hopi and Ojibwe tribes took a different approach to how they viewed this mineral. The Hopi believed that turquoise was the waste of the lizard that travels between “the above” and “the below.” The Ojibwe people have a dreamcatcher that prominently features a spider made of turquoise. They tell tales of the Asibikaashi, or Spider Woman, who found and gave the missing sun back to the people. The dreamcatcher is used to protect children from nightmares. The Zuni people associate the stone with the earth, believing that green turquoise represented the female figures whereas the blue turquoise represented men. Because of how often it was used, it makes perfect sense that turquoise would make its way into jewelry, so people could wear the stone and bring its mystical qualities with them wherever they went. Specifically, the Navajo and Zuni tribes began to work with this mineral, so they could keep its strength with them. Both tribes are well known for their craftsmanship and distinct styles. Silversmithing was introduced to the Navajo people allegedly by a man named Atsidi Santi, who learned how to work with iron from Mexican silversmiths in the 1850s. Spanish settlers who came in the 1500s and conquered the Puebloans also influenced this practice, and it’s thought that Atsidi taught others how to work with metal, including his four sons who helped pass on the tradition. 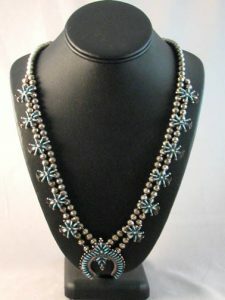 Navajo and Zuni styles include Heishi and Squash Blossom necklaces. The Squash Blossom necklace is believed to be the most enduring of all the styles and is timeless, complementing all types of attire. 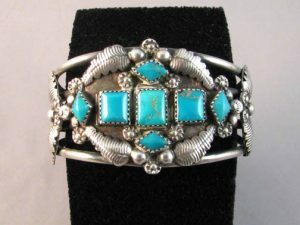 Authentic turquoise jewelry is a great investment, as it tends to appreciate in value and will never go out of style. Wearing turquoise jewelry pays homage to the history of the tribes and honors the beauty of the stone. 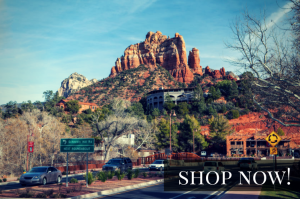 Kachina House is Arizona’s largest distributor of Native American art in various forms. Browse our extensive jewelry collection and authentic turquoise pieces which will infuse you with good fortune and strength. Call us at 800-304-3290 to discuss our pieces in more detail or visit us in the store! 5 Responses to Why is Turquoise Significant in Native American Culture? This is a very interesting article. I learned many things that I did not know. Very interesting. I Love the history behind it !!! We do what we can…happy to know our stories are making a difference.